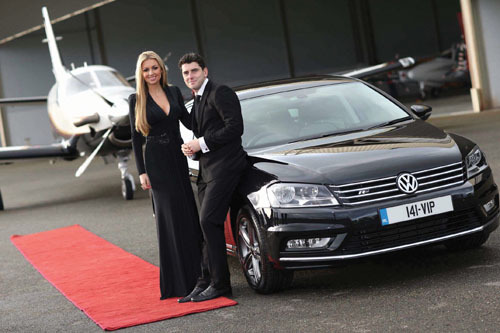 Pictured at the launch of the new Volkswagen VIP package are Volkswagen ambassadors Bernard Brogan and Rosanna Davison. We all like to feel like a VIP and Volkswagen tells us that their customers in 2014 will get the full VIP treatment with a new finance package. Brand ambassadors Bernard Brogan and Rosanna Davison were on hand to launch the VIP sales event which offers customers the option of upgrading to higher spec models for a very low cost on orders placed before December 20. In 2014, Volkswagen says that their new cars will come with three years free servicing, three years warranty, and three years roadside assistance for added peace of mind, but thanks to Volkswagen Bank, Volkswagen is also offering a superb 3.9 per cent APR finance rate across the range of Volkswagen Passenger cars. So far in 2014 Volkswagen Bank has already lent €42 million to Irish motorists purchasing new Volkswagens. Volkswagen explains that this means that motorists can get into a Polo from as little as €159 per month, the Golf from as little as €229 per month, a Jetta from €249 per month, Passat from €289 per month, Tiguan from €289 per month, and Beetle for €239 per month. This is under Volkswagen’s clever PCP (personal contract plan ) which allows you to have three options at the end of your three year finance agreement. Consumers can then keep the car by making a final payment, hand back the keys and walk away, or refinance into a new car. Almost one in three (31 per cent ) of new Volkswagens financed are through PCP from Volkswagen Bank. For a limited time only Volkswagen says that it is offering an upgrade to higher spec models for just a small increase in monthly payments. For instance they claim that this means getting the Polo Comfortline for just €179 per month (normally €199 ), the Golf Highline for €256 per month (normally €279 ), the Jetta Highline for €271 per month (normally €299 ), the Passat Edition-R for €319 per month (normally €369 ), the Tiguan Edition-R for €339 per month (normally €379 ), and the Beetle Sport for €291 per month (normally €319 ). Volkswagen says that all of these prices are available on those orders placed before December 20 from Volkswagen retailers. And of course, as is always the case with finance, terms and conditions apply.